It is a winter’s afternoon just before the recent snow and the sun is about to drop down behind the nearby hill. It’s quiet, but not silent: somewhere not far away there’s the sound of a quad bike ticking over and beyond the trees some guns are at their work – a shot cracks through the cold air every minute or two. Parkland – old trees, iron railings, grass cropped by sheep – stretches behind me towards the golden-stone Stanway House next to its church, barn, and cluster of cottages. But I have my back to all that, and I’m focussing on this unusual building, the wooden cricket pavilion built for the author J M Barrie, who regularly stayed at Stanway House in the 1920s. 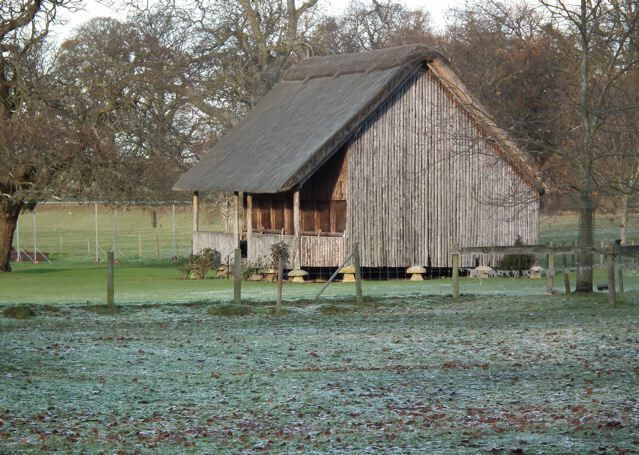 It (and a nearby tennis pavilion) was the work of a local builder, John Oakey, who provided walls of larch poles and a roof of thatch. Neither of these materials is typical of the Cotswolds and coming on this odd structure in this limestone country pulls one up short. But in a surprising Cotswold touch, the whole thing rests on staddle stones, those mushroom-shaped objects originally meant to support granaries, lifting them off the ground to deter vermin. These days staddle stones are more often seen lining people’s drives or keeping cars off grass verges, so it’s good to have this reminder of their original purpose. The more medieval parish churches I visit, the more I’m struck by the way their architecture and decoration varies form region to region. Often this is a matter of building materials, but just as frequently it’s a question of some local preference for a specific kind of feature or visual effect. And sometimes, this preference produces work of such quality that it stands out from the crowd – the graceful stone spires of Northamptonshire, the extraordinary decorative carving of the small Romanesque churches of Herefordshire, the woodwork – screens, font covers, angel-crowded roofs – of East Anglia are all memorable examples. 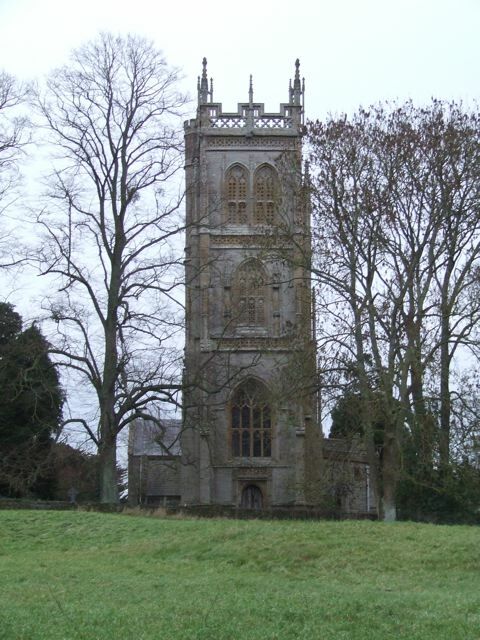 So are the wonderful late-medieval towers of Somerset, of which Huish Episcopi is one of my favourite examples. These tall and elaborate towers, built in the 15th century, dominate town centres and sometimes surprisingly small villages. They mostly follow a similar pattern, on which the masons played subtle variations. There is a large window above the doorway; above that, storeys are separated by bands of carving, and the upper levels have openings that look like windows but contain pierced stonework to allow the sound of the bells to carry. There are sometimes niches for statues. The tower is crowned with a lace-like openwork parapet and slender pinnacles. The tower at Huish Episcopi has all these features, arranged in a beautiful balance, so that we look up in admiration. The 100-foot tower is rather big for the church it crowns, but, no matter, it takes the breath away. The interior of this church has one treasure from a later era that also stops visitors in their tracks. 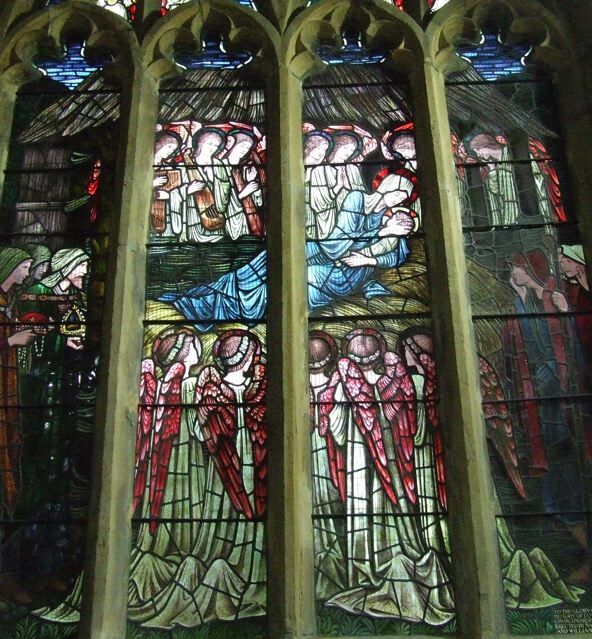 This is the stained-glass window of the Nativity, designed by Edward Burne-Jones and produced in the workshop of William Morris. Crowded round with onlooking and music-making angels, Mary reclines on the straw of the stable, cradling the infant Jesus in her arms. The Magi wait on the left to present their gifts. It’s an unusual composition, dominated by the pale robes and pinkish wings of the host of angels, topped by the stable roof and the hint of a starry sky, and the elongated figures are very much of their time. If the recumbent Mary seems odd to our eyes, she has a long pedigree: there are examples of this posture in Nativity scenes in medieval stained glass in Chartres and Cologne, worthy sources of inspiration for a window in this noble building crowned with its wonderful tower. I hope you’ve enjoyed the blog this year. Season’s greetings to you all. Note: A commenter has pointed out that the Mary is often portrayed in a recumbent posture in Byzantine art. There are a couple of examples here. Regular visitors to this blog will know all about my enthusiasm for corrugated iron as a building material. Barns and, especially, churches, made of the material have caught my eye in the past. 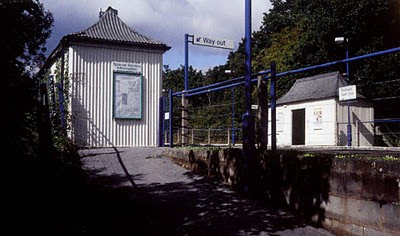 So it will come as no surprise that I’m also keen on corrugated iron railway architecture. These are amongst the humblest examples of their kind, but are not without a certain flair. 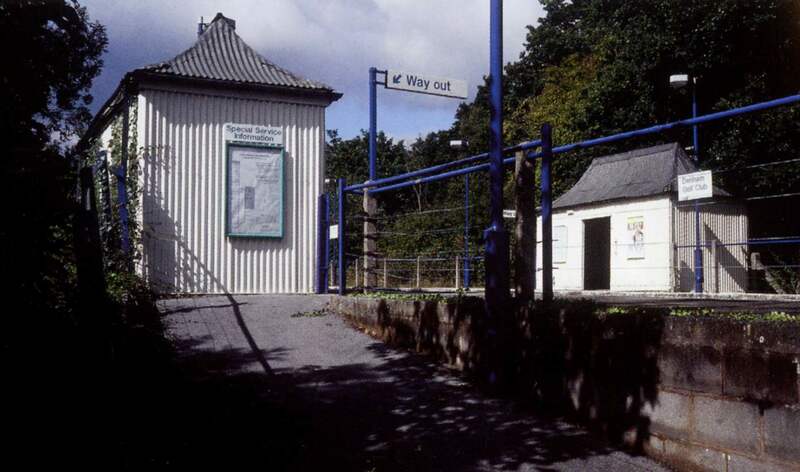 They’re called pagoda shelters, and were a form of building introduced by the Great Western Railway in about 1904 as a way of providing cheap platform waiting space at small stations and halts. These particular examples are at the station at Denham Golf Club, which came along a couple of years after the club itself was founded in 1910. I found out about them from Peter Ashley, photographer and chronicler par excellence of Unmitigated England, who supplied the photograph in which the wrinkly surface of the metal stands out like magnified corduroy in the sun. They have been repainted since this picture was taken, but are otherwise the same. He and I both like the way in which corrugated iron’s propensity to yield to a gentle curve has been put to use in the galvanized roofs of these little buildings, giving them their pagoda-inspired outline. This care with a humble building comes from another age, an age in which, as Peter has said, ‘it is not difficult to imagine plus-foured golfers arriving here and lighting up their Player’s cigarettes in the dim recesses of the iron shelters’. The Players (though not, perhaps, the players) may be gone, but these unassuming shelters have survived from another age. Croome is historically important because it is the first major work of the great landscape gardener and architect Lancelot Brown, known as ‘Capability’ Brown because of his habit of assuring prospective clients that their grounds had great ‘capabilities’ for improvement. At Croome, Brown designed both the house and the park, although his work was supplemented in the house by Robert Adam, who worked on the interior, and James Wyatt, who designed some of the ‘eyecatchers’ around the edges of the park. The park itself, created for the 6th earl of Coventry from 1747, was designed to feature a river, imitating the nearby Severn, and a large curvaceous lake with an island. Stately trees punctuate the views, as do a fascinating selection of garden buildings, including a grotto, guarded by a Coade stone statue of Sabrina, goddess of the Severn. Some of the buildings were designed by Brown, some by Adam, and James Wyatt added several of the more distant eyecatchers, including a ruined ‘castle’ that I included in an earlier post. I was planning to do a post about Brown’s grotto at Croome, but on the frosty afternoon I walked around the park the other day the statue of Sabrina was swathed in wrapping, put to sleep as it were for the winter under a protective puffy green duvet, as were the other statues and urns dotted about the park. So instead, here’s a building called the Temple Greenhouse, which was designed by Adam. Today it looks more like a temple than a greenhouse, because the windows that were once fitted between the columns have been removed. 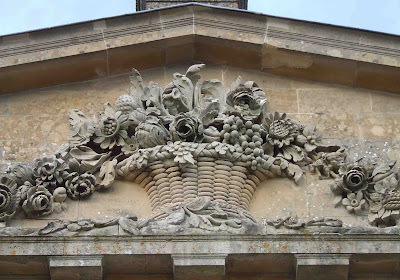 So it can no longer contain exotic plants, but still makes a noble feature in Croome’s landscape. Adam included symbolic sculptures to complement the vegetation that once filled the greenhouse: overflowing cornucopias and this brimming basket of flowers. These vigorous reliefs are full of life, with a variety of blooms turned this way and that, and leaves twisting, as it were, in the breeze. They bring a welcome bit of summer to the frosty winter landscape. Croome Park is owned by the National Trust, and there are some stunning photographs of it here. The house, Croome Court, is owned by the Croome Heritage Trust, and is leased to the National Trust, which is managing its restoration. The recent cold weather, which has clad the Cotswolds in ice and snow, has meant I’ve not been much out and about exploring buildings. 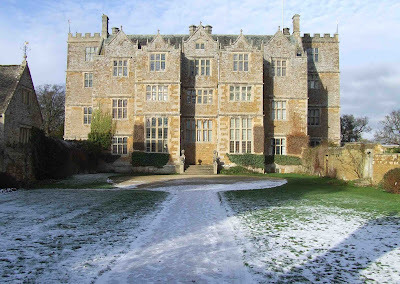 But a trip to have a pub lunch with friends took me within a short distance of Chastleton House, an old favourite of mine, so I decided to slither along the icy lane to this early-17th century Oxfordshire marvel, and have a look through the gates. The picture shows the entrance front as one sees it from the lane, its limestone walls and mullioned windows not much changed since the house was built between 1607 and 1612. The first owner was Walter Jones, a lawyer and MP, and the house went down through his family, from father to son, and uncle to cousin, until it passed into the care of the National Trust in 1991. My observant readers will already have noticed that there is no visible entrance on this entrance front. That’s because the doorway is concealed in one of the protruding bays that flank the centre of the facade – you climb the short flight of steps and the door is right there, on your left. What you find when you enter is an interior not much altered since the Jacobean era – the family never had money for alterations or makeovers, and lived a life apart from the world of fashion. Oak panelling, tapestries, and wonderful plaster ceilings abound, together with some ornate fireplaces and carved oak furniture. Because there had never been much money to renovate, repairs had been done on a rather ‘make do and mend’ basis and the policy since 1991 has been to keep up this tradition with ‘minimal repair and almost no modification’. The result inside the house is in places oddly tatty, a lived-in look for a house that is no longer lived in. Some find this jars, and I can understand their reservations – and those of people who think a house like this should be lived in rather than kept as a museum. For what it’s worth I don’t share these misgivings. I think the way the house is maintained is sympathetic to the way it was kept by its owners and an education to those who come to see it – and those who come do come to see the house: there’s a minimum of add-on spend opportunities here. But none of this was very relevant the other day as I stared in wonderment at the sun-drenched limestone of Chastelton’s walls and roofs and mullions. The craftsmanship, the rhythm of gables, windows, and towers, the quiet on this freezing morning when no one was out and about – all were as nourishing to me as the hare pie and bitter I was soon to consume. Back in the shiny 1980s, I remember standing in front of a London building site on which a new office block was going up. I was with an architect of my acquaintance, and the building was none of his doing. He contemplated the sheets of shiny cladding with which the building was being covered. ‘I call them fall-offs,’ he said. ‘Because they fall off.’ We bemoaned the terrible times, but we were both well aware that bits of buildings have been falling off for centuries. Take Liardet’s patent stucco, for example. From the 17th century onwards, the type of plaster known as stucco was widely used to cover the outsides of buildings to create a finish that looked like the finest stone – at a fraction of the cost. 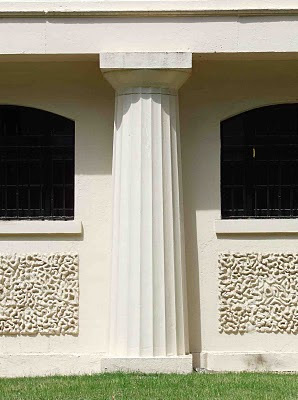 As well as providing a smooth render for walls the material was also well suited for the production of moulded decorations – reliefs, swags, heads, and all the other motifs with which builders and architects, especially the classical architects of the 18th century, loved to adorn the facades of the best houses. 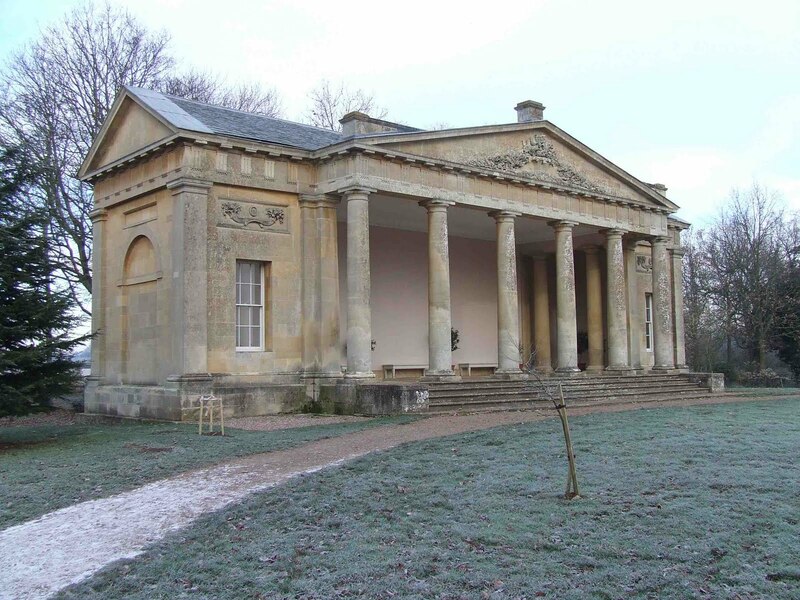 Robert Adam and his less famous brothers were among the most enthusiastic users of stucco. 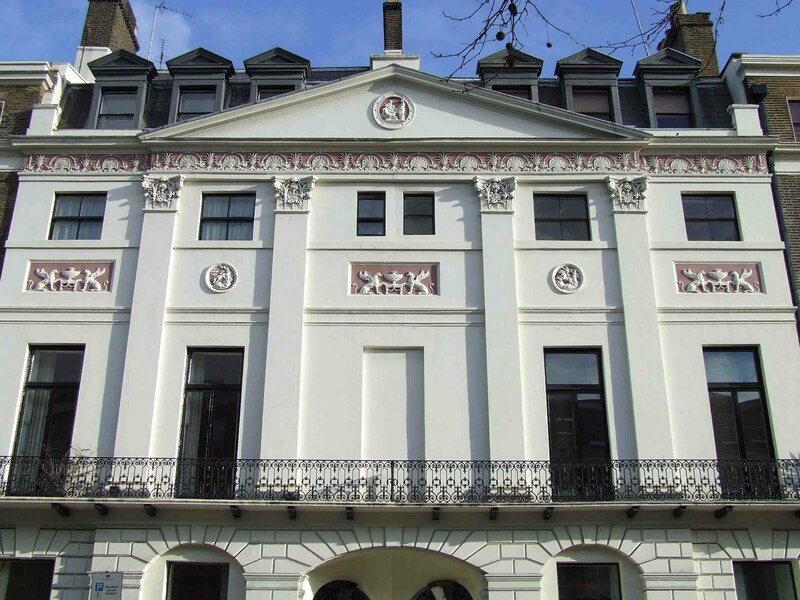 By the time the Adams were designing buildings several recipes of stucco had been developed, but the brothers favoured a specific one, an oil-based stucco devised by a Protestant clergyman from Lausanne called John Liardet. Liardet’s stucco, was an oil-based material – it contained boiled linseed oil instead of the water used in other mixes, and this was said to make the plaster more readily workable. The Adams were enthusiastic about Liardet’s recipe, and acquired the exclusive right to use it – it seemed to be ideal to produce the delicate reliefs and other decorations that they liked so much. These details from a pair of houses in Portland Place show the kind of effect that the Adams created with Liardet’s stucco in the years after they made their business arrangement with him in the 1770s. The reliefs echo on this exterior wall the cameo-like panels showing classical figures, flowers, swags, and other designs that Robert Adam, especially, used to decorate his interiors. 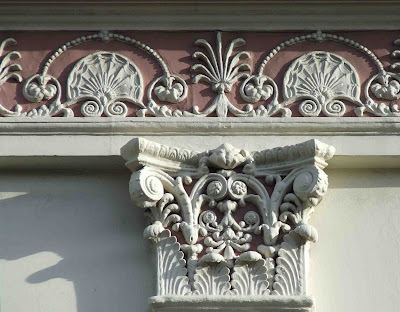 The Portland Place decorations are rare survivors – and in fact are probably restorations rather than survivors in the strict sense. This is because soon after these houses were decorated with Liardet’s stucco in 1778, a problem emerged. 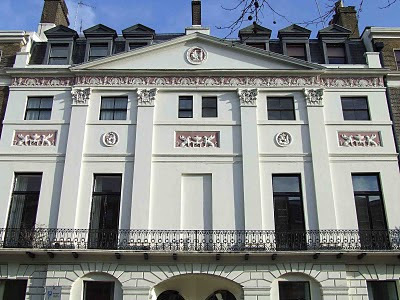 The stuff turned out to have a far from tenacious attachment to the walls, and stucco was soon sliding off buildings and landing on pavements and in areas, At least one of the brothers’ clients, Lord Stanhope, pursued them for compensation, and the use of this kind of stucco was abandoned. By the end of the 18th century, more stable stuccos were available and one kind of fall-off, together with its hapless inventor, was consigned to the footnotes of architectural history. As the BBC1 series Turn Back Time: The High Street comes to an end next week, I am rounding off my series of shop posts by refreshing my ‘Ten of the Best’ feature. In the column to the right, under the English Buildings Book, you’ll find links to ten past posts from this blog, all on a shop or High-Street related theme. Victorian carvings, Art Nouveau curves, Edwardian ornament, and 1930s tiles are among the highlights from a group of buildings that adorn the towns that contain them. I hope you find something here to enjoy. Having in 1848 got the job of running book stalls on the stations of the London & North-Western Railway, W H Smith have a claim to be England’s first retail chain. Their move on to the High Streets of Britain came rather later – there was a major expansion at the end of the Victorian period, some further growth in the first decade of the 20th century, and a series of outstanding shop makeovers between the two world wars. 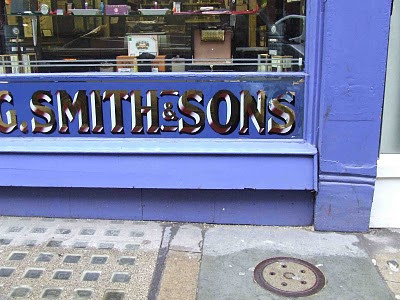 By this time Smith’s were well known for their combination of news, books, stationery, and other sales, together with lending libraries at some stores, and their shops stood out. Window frames in light oak and careful decorative details (including even distinctive rainwater goods) were their hallmarks, along with this lovely newsboy hanging sign. There are still a few of these signs around. 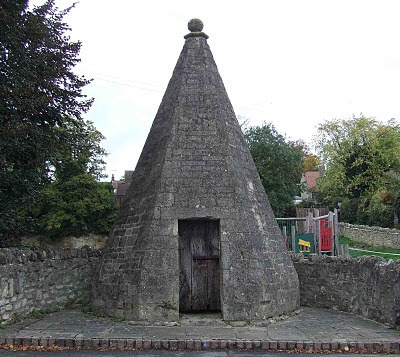 This is one I pass regularly, a small landmark in the Cotswold town of Cirencester. Peter Ashley, chronicler of Unmitigated England, spotted another at Hull’s poetically named Paragon station. So many of the telling details of Smith’s interwar shops have vanished. A number bore literary quotations in ornamental lettering. A favourite was Shakespeare’s line from Titus Andronicus, ‘Come and take choice of all my library,’ and in my infancy my local W H Smith shop was emblazoned with Wordsworth: ‘Dreams, Books are each a World and Books we know are a substantial World both pure and good.’ Amen to that. 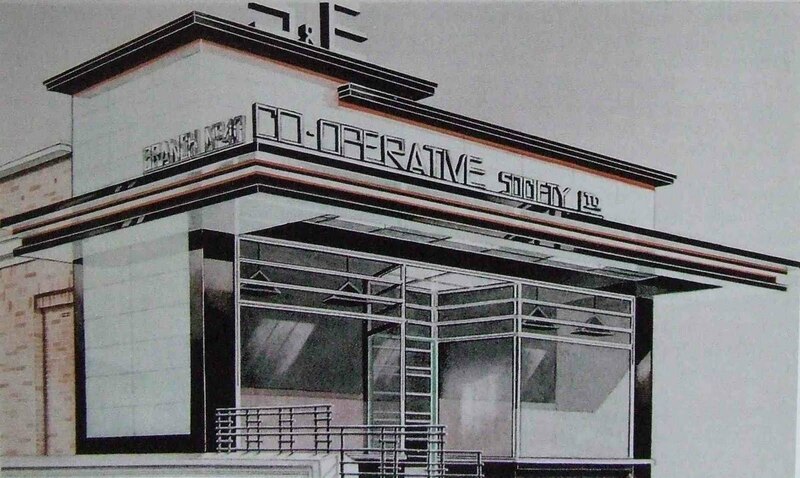 This 1936 design features the Midhill Road branch of the Sheffield and Ecclesall Co-operartive Society. Designed by J W Blackhurst, it is a resplendent combination of plate glass, chromium trim, lettering made up almost entirely of straight lines, and the signature material of 1930s shop fronts, Vitrolite. Vitrolite, a form of coloured glass available in a range of hues including orange, black, pale yellow, and pale green, produced hard shiny wipe-down surfaces that were much admired in the 1930s. The material is not so common today, but a skin of black Vitrolite still covers the Daily Express building in London’s Fleet Street. Vitrolite and chrome were used with flair in this shop front, now alas demolished. The dark cornice, overhanging canopy, grids of glazing bars and railings, and the lettering, all combine in a glittering, angular whole. It’s flashy, in the way the Art Deco cinemas are flashy, but also hygienic and wholesome, a blending of apparent opposites not unlike the powerful combination of capitalism and mutual ownership on which the co-operative movement itself was built. Coming across this on an autumn morning on a quiet road in Warwickshire is enough to bring the curious traveller to a halt, and reduce one to slack-jawed and questioning amazement. What is it, exactly, and why is it here? 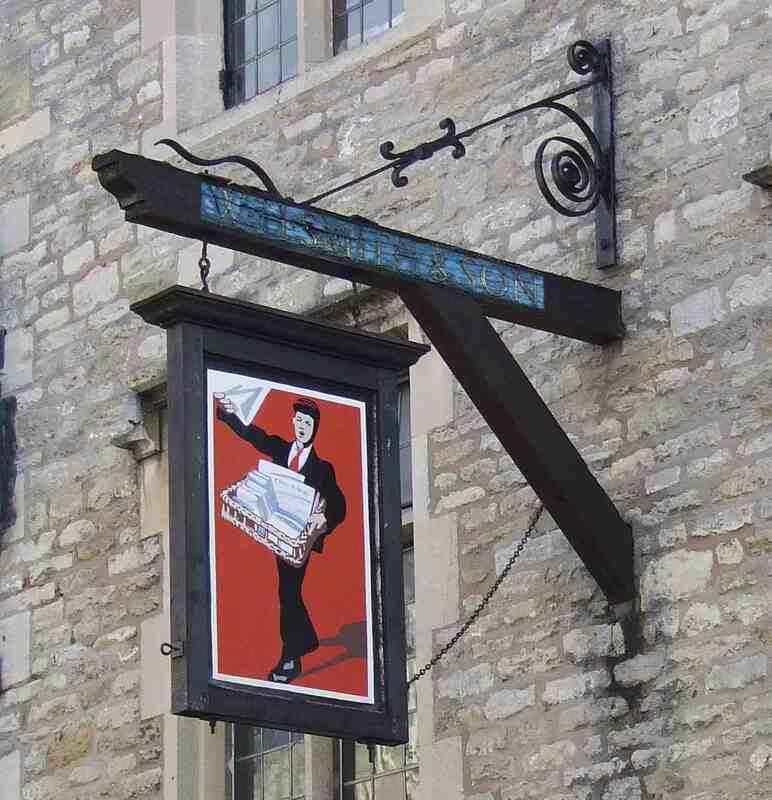 The short answer, it’s a pub, is only part of the story. This stone tower hasn’t been a pub all its life. It’s not a castle either. The windows are much too big for a medieval castle that had to defend itself against slings and arrows. The battlements are too slight to conceal all but the most elfin defender. The whole thing looks more like the fanciful Gothic (or ‘Gothick’) of the 18th century, intended to make its mark in the landscape. And so it proves. The tower at Edge Hill was built by Sanderson Miller, a local gentleman and amateur architect who was improving his estate in the middle of the 18th century. 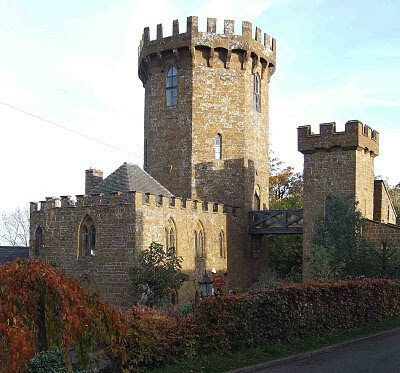 As well as transforming his Tudor house at Radway in the Gothic style, and doing up his gardens, he built the octagonal tower as a combination of eyecatcher and viewpoint, right on the edge of the escarpment. According to legend, the place was also the precise spot where King Charles raised his standard before the battle of Edge Hill, the inconclusive clash of 1642 at the beginning of the English Civil War. In 1747, Miller put up the octagonal tower, and he soon added the adjoining buildings, including the square tower and bridge, recently renewed, designed to span the road. The octagonal part is modelled on a tower at Warwick Castle, and commands panoramic views across the plain below. As if the links with the vast castle at Warwick, and with Charles I, weren’t allusions enough to English history, the interior included a ceiling decorated with the coats of arms of the Saxon kingdoms. So the Edge Hill tower was a building with ‘heritage’ plastered all over it and tradition set in its stones. But in the 1740s this was all rather revolutionary. Gothic was still an unusual style for country houses, but at the same tima as Miller was working at Edge Hill and Radway, Horace Walpole, the man credited with kick-starting the 18th-century Gothic revival, was rebuilding his Twickenham House, Strawberry Hill, in a similar, yet more fanciful, Gothic style. Miller’s work, like the more famous Walpole’s, caught the imagination of country house owners. A number were soon asking Miller to redesign their homes, and a modest scattering of castle towers, fan vaults, tracery, and sham ruins began to spread across Warwickshire and beyond. Miller’s tower, at first glance a rich landowner’s folly, was also an architect’s calling card. From its 19th-century roots in the Rochdale, the co-operative movement grew rapidly in the Victorian and Edwardian periods to become a force to be reckoned with on Britain’s High Streets. There were co-ops everywhere, and they were prized for their combination of quality and fair pricing, and also for their values – from ownership by the members and democratic member control to the support of education and community. These values, enshrined in a list known as the Rochdale Principles, still shape the co-operative movement today. 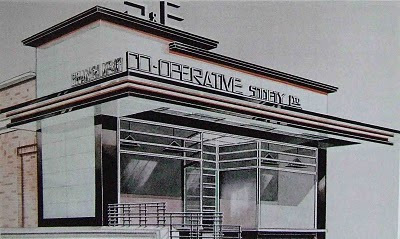 By the 1930s, although the really big expansion was over, co-ops big and small were still being built. The principal architects who worked for the co-operative movement, William A. Johnson of Manchester and Leonard G Ekins of London, were both enthusiastic modernists. The work of Ekins, for example, developed from an Art Deco not unlike the style of 1920s and 1930s factory architecture to a more hard-edged steel and glass modernism. This co-operative store in Northampton shares several features with Ekins’ earlier work – the white walls with touches of green, the tall windows, the dark green plinth at the bottom and the stepped-back effect at the top. If it’s not actually by Ekins, it is probably the work of an architect who had studied his buildings. Whoever designed it, the building has proved durable. It’s now an arcade full of small independent shops, while the tiles of the street frontage still bear the name of the original owner, picked out in capitals. 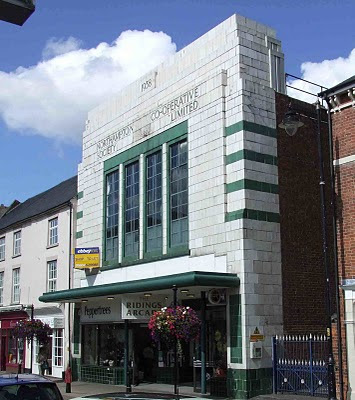 Here's another example of Art Deco tiling on a co-op, this time in Tamworth, which I blogged about a while ago. Often, of course, the process of ‘getting’ a cat is rather passive. A cat arrives, and if the humans are welcoming enough, the cat stays. Something like this probably happened in 1963, when a tabby adopted the verger of Fairford church and his wife. 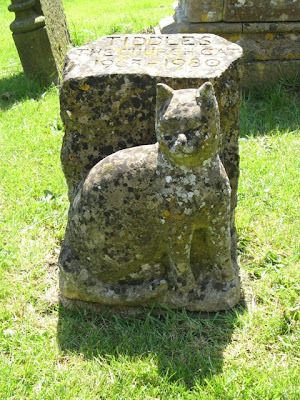 Tiddles stayed, became the church cat, and attracted the affection of visitors, who come to Fairford to admire the stunning late-medieval stained glass, and of parishioners, on whose laps she sat during services. No doubt her mousing skills were not much used. But the parishioners of Fairford were doubly sure. And when Tiddles died in 1980, this stone, carved by Peter Juggins, was erected near the south porch. Requiescat. The High Street renews itself all the time. Old shops get makeovers, new businesses come along, and with each change a fresh signboard goes up. Sometimes, though, it’s just the sign that’s changed, or a coat of paint that’s added. 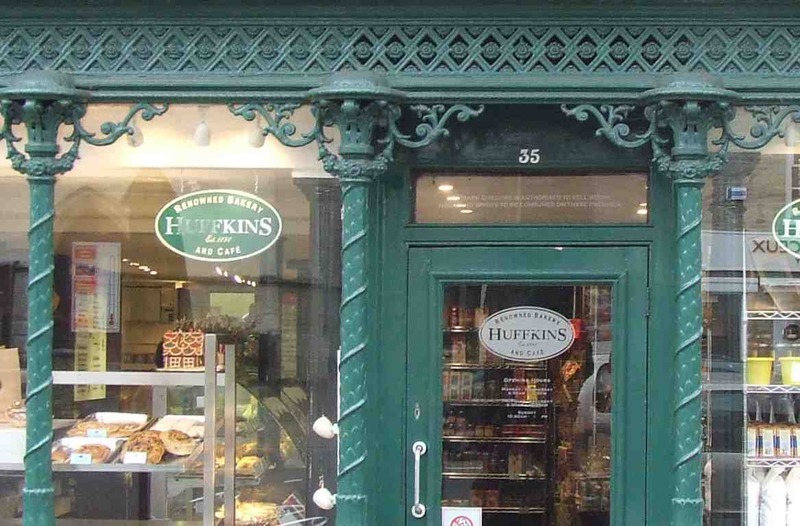 And if that’s the case, part of the old shop front stays to tell us something about the history of the building. I like the way fragments of old decoration, bits of moulding, a pane of glass high up in a window, can drop quiet hints about a shop’s previous occupants. 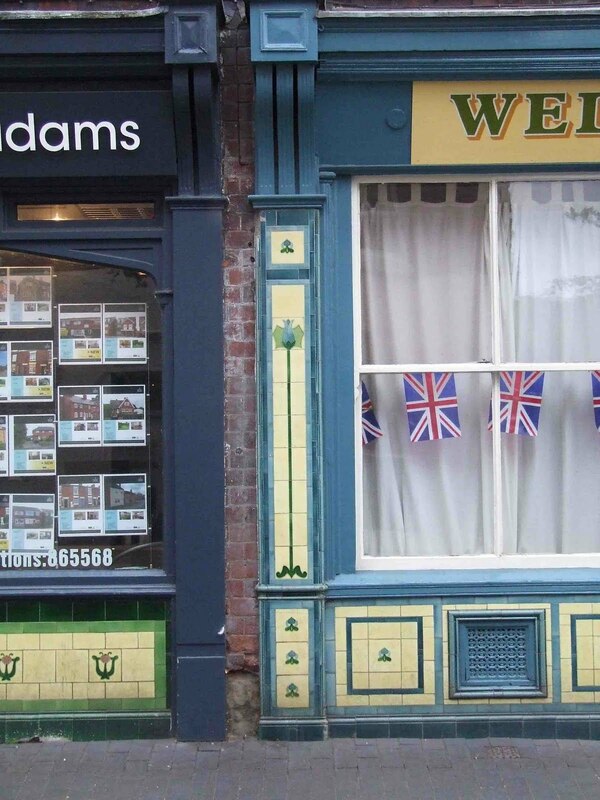 Tiles, among the most durable of decorations, sometimes linger in this way, and here are a couple of neighbouring examples in Melbourne, Derbyshire. I don’t know exactly when these shop fronts were tiled, but I’d guess in the Edwardian period – the designs seem to bear that influence of Art Nouveau that I often saw in the tiled surrounds of Edwardian fireplaces when I lived in London. Back in the early-20th century, firms such as Minton and Doulton were producing millions of tiles that brought a bit of colour – and a sense of hygiene – to the High Street. Butchers, dairies, grocers, and fishmongers were among their most enthusiastic customers. They liked the bright, easy-care surfaces, which were often continued inside the shop. On many early shops there was often a blurring of the boundary between inside and outside. Butchers, for example, would hang meat on rails in front of the window, and both butchers and fishmongers had opening shop windows, enabling customers to see the goods or talk to the proprietor without even stepping inside. The right-hand shop in the picture has an opening sash window, and probably once sold meat or fish. 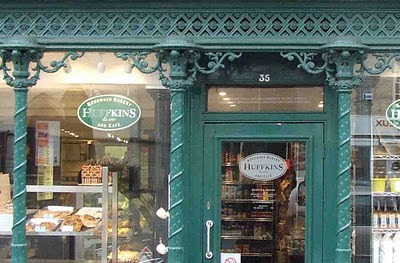 Few High Streets have complete surviving Edwardian shops like the ones lovingly reconstructed in the BBC’s Turn Back Time series. But in many towns there are fragments like these strips of tiling, which afford colourful glimpses of the history of the High Street. For readers interested in Melbourne, there's a post about its wonderful Norman church, here. For more on tiled shop fronts, see a post about a street in Cheltenham, here. Small-town shopkeepers like those in the excellent Turn Back Time: The High Street didn’t usually have shop fronts with the full complement of glittering effects that were sometimes seen in the Victorian period. But in London is was a different story. Where there were hundreds of shops competing for one’s attention, Victorian shop designers did everything they could to catch the eye of potential customers – bright colours, lots of lights, gilding, and lavish displays of goods. Painted glass, often with mirror effects, was a favourite material for shop names, numbers, and glittering descriptions of the goods on sale, especially in the second half of the 19th century. Passing fashions and the fragility of glass mean that few of these dazzling signs have survived. Some of the best loved are on the umbrella shop in New Oxford Street that I blogged about a while back. This is another, on Smith’s tobacconists in Charing Cross Road. This was apparently the first shop to open when this stretch of the street was redeveloped at the end of the 1860s. The sparkling glass welcomes cigar-smokers in particular, as it did in the 19th century, testimony to the Victorian shopkeeper’s skill at attracting the notice and the money of those who passed by. BBC1’s series Turn Back Time: The High Street has now begun, and, as I wrote the book to go with series, there will be a few posts on shops this month, in the spirit of spreading information about this neglected aspect of architecture – and in the cause of unashamed pluggery. The Victorian High Street could be a dangerous place, where bakers laboured in dingy back rooms, using flour adulterated with alum, and where grocers happily sold cheese coloured with copper sulphate. They did all this with a grand flourish of showmanship, and this love of show was sometimes reflected in extravagant shop fronts. Ironmongers liked to set off their vast and bewildering stock (everything from nails and screws to grates and stoves) with a good-looking frontage. There are still a few of these around, including two magnificent Victorian shop fronts in Witney. Originally made for ironmongers, these fronts are made, appropriately enough, of cast iron. They’re a matching pair, at opposite ends of the town, and made around 1870–1880 by some unsung foundry. At the top of each frontage are intricate diamond shapes linked together and enclosing rosettes. Up each shaft winds twining foliage. Delicate scrolls twirl across the corners of the glazing. 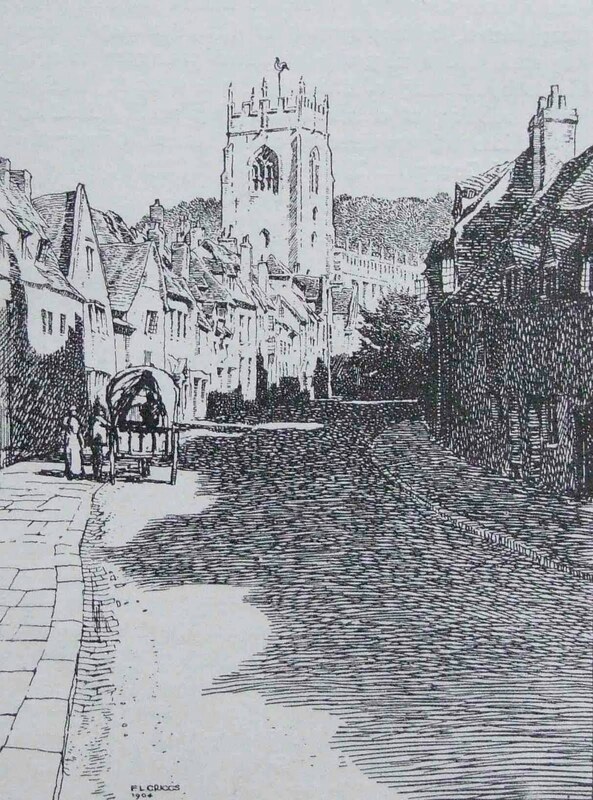 This feast of decoration must have amazed the Victorian shoppers of Witney, and must have drawn people towards Leigh’s at one end of the town, by the green, and Thomas Clark and Son at the other end, in the High Street. 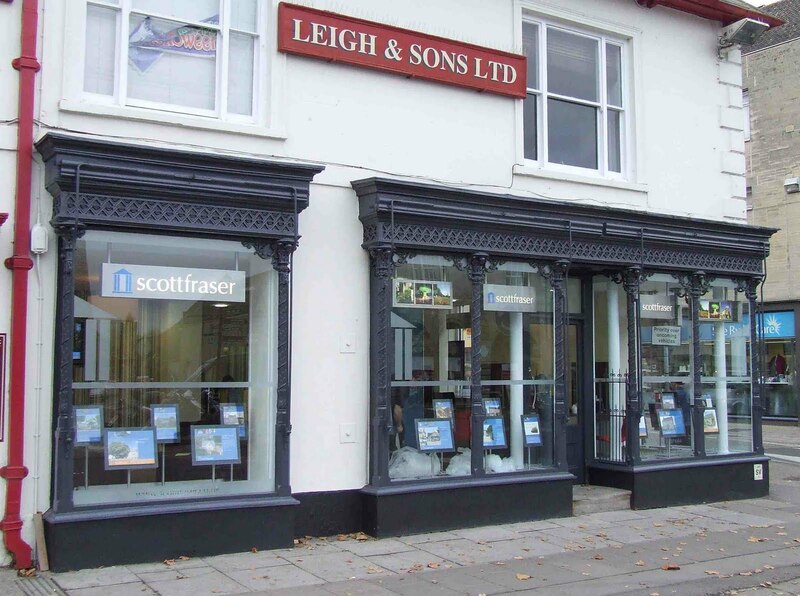 Neither of the shops is now an ironmonger’s, but these stunning iron frontages still house businesses – a bakery and an estate agent – that contribute to a vibrant and busy High Street. I remember that when I was a child my parents had a book with a picture of this gatehouse in it. The gatehouse was identified as belonging to the manor house at Ashby St Ledgers in Northamptonshire, and the reason it was illustrated was because this house was the home of Robert Catesby, leader of the group of Catholics who plotted to blow up Parliament and James I on November 5th 1605 in the hope of then installing the king’s nine-year-old daughter as a Catholic head of state. Plots of all kinds fascinated me, especially the Gunpowder Plot, not because of any Catholic or republican sympathies but because it was the cause of fireworks, bonfires, Guys, sausages, and other delights. * I imagined people plotting in the upper room of this gatehouse, from which, no doubt, they’d be able to escape in a hurry if royal spies got wind of their scheming. 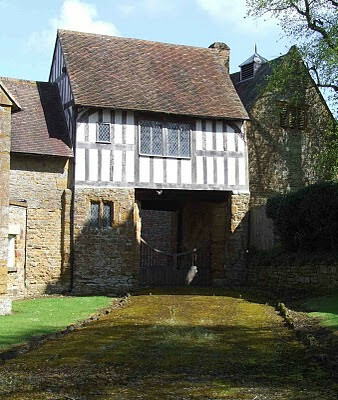 When I finally visited Ashby St Ledgers, I was amazed that the gatehouse forms a tiny part of the whole house, which is huge – more like a cluster of large houses than a single dwelling. But being near the road, the gatehouse is indeed a good place for plotters, who could both keep a lookout and decamp quickly if they needed to. Its simple architecture, a good deal more rustic than that of the main house, also lends it a useful air of innocence. When the plot was discovered, Robert Catesby fled from London and when trying to make a stand against his pursuers in Staffordshire was shot dead. I must admit that I was pleased to find that his gatehouse had survived. *My overseas readers may need to know that these things, especially fireworks, attend the yearly celebrations of the discovery of the plot on November 5th. Fireworks are lit all over the country, but the towns of Sussex, where pyrotechnics become spectacle on the grandest of scales, excel in the art of whiz, flash, and bang. Like some sort of rustic mausoleum – the pyramid of an old geezer – this little building pops up in the Oxfordshire village of Wheatley to surprise the passer-by. 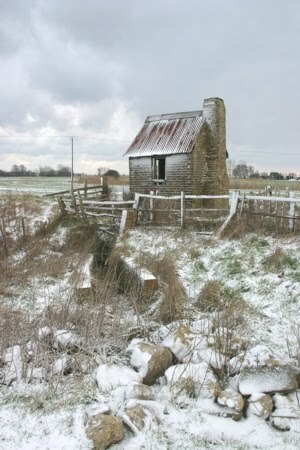 It’s not a mausoleum, though – there’s no churchyard hereabouts – but something that was an essential for a village of any size before the mid-19th century: a lock-up in which wrongdoers (drunks, petty thieves, kickers of buildings, and other ne’er-do-wells) could be detained overnight before being brought before the beak in the morning. They’re usually small, and built completely of masonry, usually stone, to prevent inmates from pushing tiles off the roof and climbing out. English buildings don’t usually have roofs made completely of stone. We have stone-covered roofs here in the Cotswolds, but they’re made up of stone ‘slates’ supported on timber frames, and are far from secure. What I’m talking about here is a stone roof that’s as strong as the walls beneath it. Creating this kind of structure has led to some interesting designs, and this is one of the best: a tall hexagonal pyramid, with no distinction between the roof and walls at all. Who came up with this unusual and arresting form? It used to be thought that the little building was designed by Vanbrugh. It’s certainly the kind of bold, uncompromising shape that Vanbrugh liked, but it’s a bit too rustic for him. The architect of Blenheim would probably have specified smooth, high-quality ashlar instead of the rougher, coursed rubble masonry at Wheatley. Perhaps too he would have made more of the doorway and designed a more elaborate moulded capstone to support the ball finial. No, this is the work of a local mason who had perhaps seen Vanbrugh’s work: apparently a man named Cooper, who built the lock-up in 1834 – more than 100 years after Vanbrugh died. 1834 is very late for a village lock-up. In 1839 the County Police Act allowed paid police forces to be set up in each county – and each force had to have police stations with cells built in. Lock-ups gradually became surplus to requirements and many were demolished. Quite a number survive, but few of them are quite as memorable as this little pyramid. That’s the title of a collection of writings by redoubtable American architecture critic Ada Louise Huxtable, and straight away we know what she means. Architecture can be exasperating and many a building seems to demand to be kicked, punched, or otherwise assaulted. It’s pointless, of course: the thing will still be standing and we’ll have a sore toe. But it’s still hard to resist. Regular readers of this blog will know, though, that I mostly write about buildings I like – there’s quite enough spleen online without additions here. So I’d like to propose another reason for kicking – or at least slapping or tapping – a building: it can help you find out what it’s made of. The columns, though, are not quite what they seem. Give one a smack, and you hear, not the dull thud of stone, but a hint of a ring. They are made of cast iron. A surprise, of course, but not so inappropriate as you might think. The ancient Greeks used iron in their architecture – not in this way, but by joining together stone blocks with invisible iron clamps. Nash just took things a step further and made the whole column out of metal. As more than one architectural historian has noticed, Nash was after all interested mainly in large effects and sweeping gestures. And you never quite know where you are with him. What looks at first like a Greek revival building by Nash often turns out to be a kind of souped-up fantasy Classical. What looks like stone is usually stucco – or cast iron. He didn’t much mind whether his effects were achieved by traditional craftsmanship or modern technology. So don’t forget the senses of touch and hearing when you ‘look’ at a building. I’m always tapping away at bits of old shop fronts to find out whether they’re made of wood, stone, or metal, touching columns to discover whether they’re cool marble or some warmer imitation, knocking on surfaces that might conceal hidden hollows and voids. Kicked a building lately? You bet. I first came across the word ‘tontine’ (see previous post) when I saw this building. 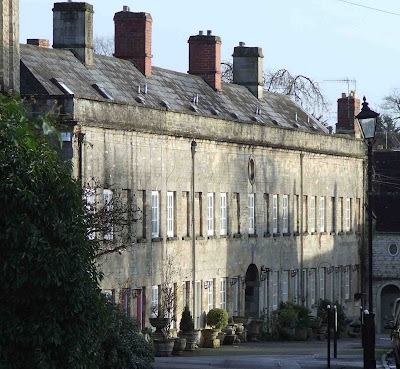 It’s in the Cotswold town of Cirencester on the wonderful Cecily Hill, one of the most beautiful streets in the town. Cecily Hill is a wide street, full of houses – Georgian here, Regency Gothick there, Cotswold vernacular elsewhere – in the local creamy stone, and ends in iron gates that lead into the grounds of Cirencester Park and the longest avenue of trees in England. 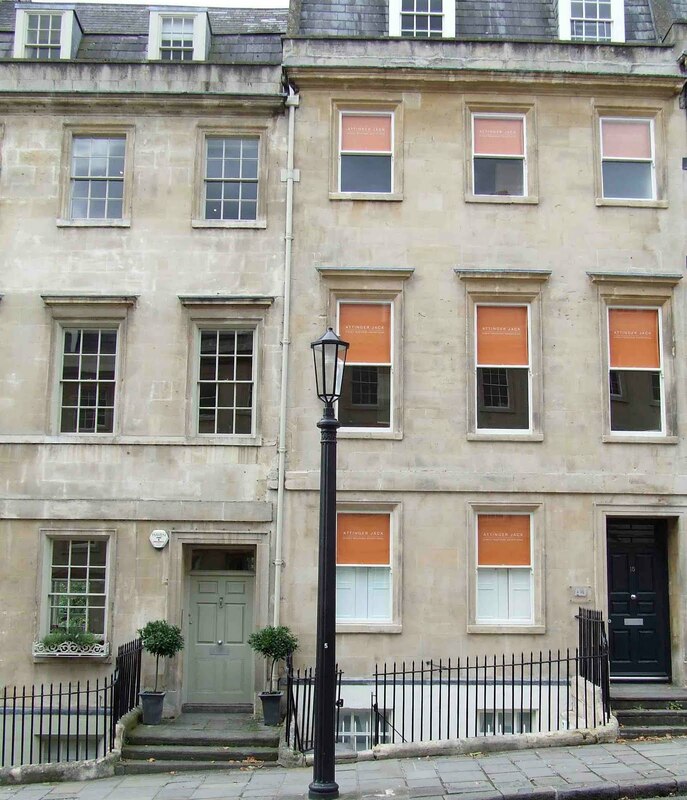 Tontine Buildings is a row of houses, and it’s said that Earl Bathurst ‘won’ it as the last surviving investor. It’s a very plain and simple building, a terrace of ten small houses with a flat, cliff-like frontage topped by a very retrained – some might even say mean – cornice. But I like its restraint, and the elegant touches, such as the curved central carriage arch and the oval cartouche containing the name, that give the row an air of quality. Not the most ornate building on Cecily Hill, then, but a worthy complement to the more showy houses on the street. And a fitting backdrop to the most impressive collection of planters in the town. 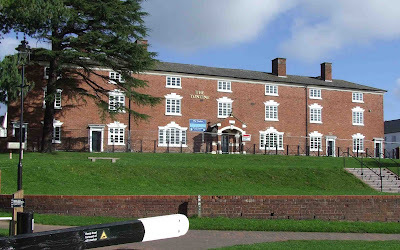 To Stourport-on-Severn, to admire the locks, basins, bridges, and waterside buildings of one of England’s most fascinating canal towns. But as usual, my eye was caught by something I didn’t quite expect. This building is called The Tontine. The central part was an inn, and the flanking portions contain houses. There are more houses in the wings, which extend out from the back of the building to give the whole thing a plan like an enormous capital E. It was built in the 1770s, although the porch was added about 100 years later. The whole building is being redeveloped as houses, and is festooned with ‘For Sale’ signs. Its red brick and neat windows look well, and the rooms at the front enjoy views across the lawn to the River Severn. 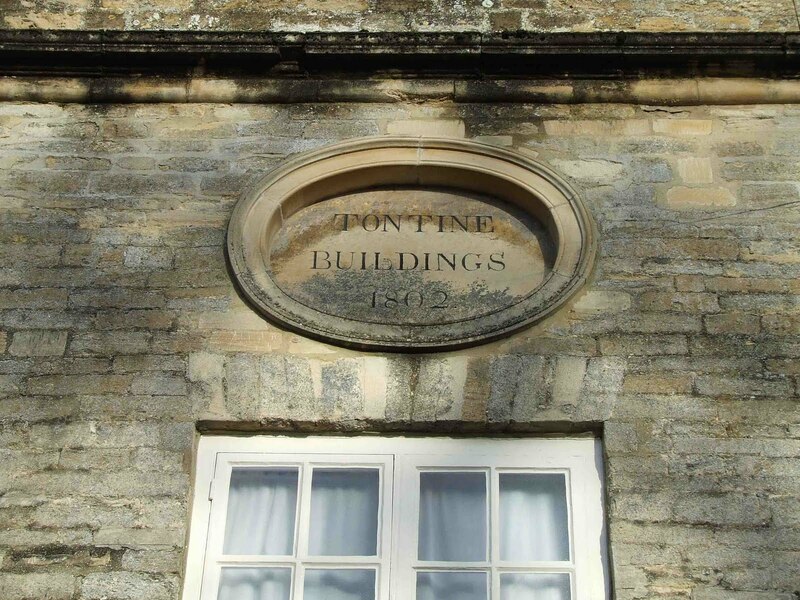 But why was it called ‘The Tontine’? A tontine was what today might be called, to use a kind of language I usually avoid, an ‘investment product’. As I understand it, it worked like this. A group of shareholders clubbed together to buy an investment, such as a property, and shared the income. But there was a twist: the shareholders couldn’t sell their shares, and when they died, their shares passed to the other shareholders. The last surviving shareholder struck gold, inheriting the entire scheme. One presumes that the newly developed houses in the building are being sold with a more conventional tenure arrangement. I make no apologies for returning once more to Bath, especially as on this visit I was drawn to an unusual building that I’d not seen before, high on the outskirts of the city on the way to Bath Racecourse. I knew it was there, I’d read about it and knew some of its history, but my reading hadn’t prepared me for the uncompromising sight that met my eyes. When I say ‘uncompromising’ I mean that this tower is perhaps of all the buildings I’ve seen in England, most unambiguously, sternly classical. 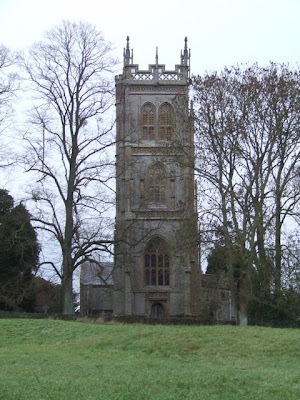 In a way it’s the exact opposite of what one would expect, for this tower was commissioned by the writer, collector, MP, and artistic patron William Beckford, the man who, obsessed with the Middle Ages, had built the most outrageously Gothic country house in the country, Fonthill Abbey in Wiltshire. Beckford, born fabulously wealthy from family sugar plantations in Jamaica, collected ravenously, picking up cheap Italian Renaissance paintings, Asian sculptures, drawings by Blake, and French furniture. He wrote travel books about Italy, Spain, and Portugal, published Vathek, a pioneering Gothic novel, and egged on his architect Wyatt and his builders to finish Fonthill with its enormous tower and vast halls, increasing the workers’ beer allowance and poaching builders from Windsor Castle in the process. Fonthill was glorious, from its 10-metre-high front doors to the top of its 90-metre tower, but both Beckford’s fortunes and his architecture proved fragile. The tower at Fonthill collapsed. Twice. Beckford lost his sugar plantations in a legal action, and he was forced to leave, and then sell, Fonthill. He retired to Bath, where he had a town house connected by gardens to this tower. The tower, designed in 1825 for Beckford by the young architect H E Goodridge, was designed to house the owner’s books and such treasures as he was able to salvage from his earlier life. The bottom section of the tower is perfectly plain, then there’s a very strong cornice supporting the belvedere, with its three tall rectangular openings on each side – from here there are glorious views over Bath and the surrounding countryside. Above this, the tower becomes octagonal, with a squat plain octagon supporting the final touch, a gilded lantern. That lantern relieves the severity of the main tower, and gleams in the sunshine, making one think as much of an ancient lighthouse as the Athenian monuments on which the building is partly modelled. 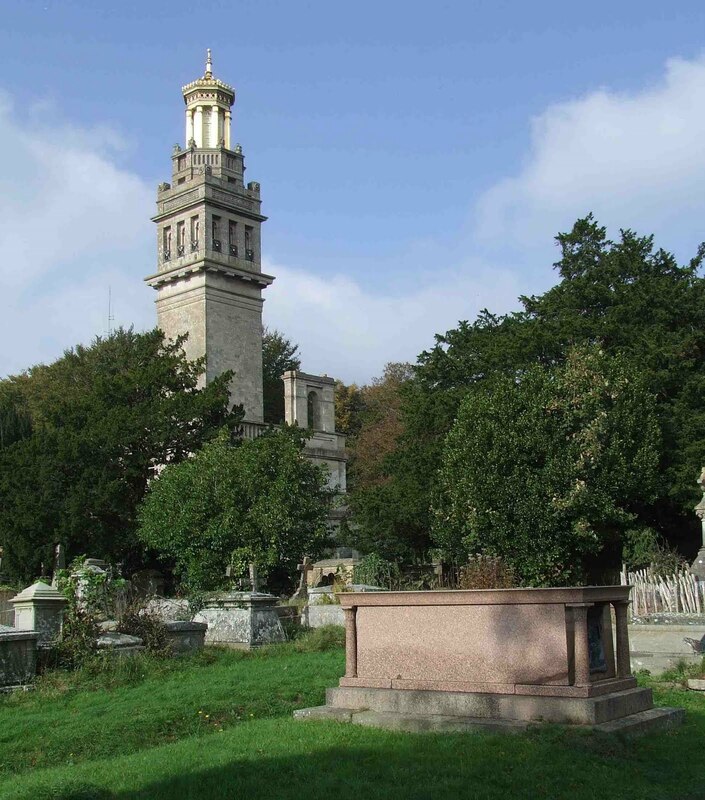 After Beckford died in 1844, his daughter sold the tower, but when she discovered that the new owner was going to turn it into a pub, she bought it back and gave the adjoining ground to the church for a cemetery. Beckford’s own tomb, in pink Aberdeen granite, is in the foreground of the picture. The great connoisseur’s final resting place is next to his final home and visitors come from miles around to enjoy the views from his tower and his tomb. The Landmark Trust operates the lower part of the tower as a holiday cottage. The tower also contains a museum that is open regularly. Both of these links contain further information about the tower. This post is to offer my condolences to my friends in Hastings for the damage caused to Hastings Pier in this week’s fire. Hastings Pier, designed by Eugenius Birch, the doyen of British pier engineers, was opened on 5 August 1872, which was Britain’s first-ever bank holiday. It is one of seven remaining piers designed by Birch, and its cast-iron columns and wooden deck sit on screw piles, patented by Birch, which anchor the structure in place. Much of this basic substructure remains. The buildings on top have been much altered over the years, both because of damage caused by an earlier fire (in 1917) and to reflect the changing uses of the pier – from a combination of promenade and landing stage for paddle steamers to the home for a host of entertainments (music hall, theatre, slot machines, bingo, rock concerts, and so on and on). The pier’s recent history has been troubled. Storm damage has led to periodic closures and there has been widespread concern about the neglect of the structure by its offshore owners. The Hastings Pier & White Rock Trust (HP&WRT) was formed to raise money to restore the pier and to return it to community ownership. Huge progress had been made, including an agreement by the local council to use compulsory purchase powers to buy back the pier, when this tragedy struck. 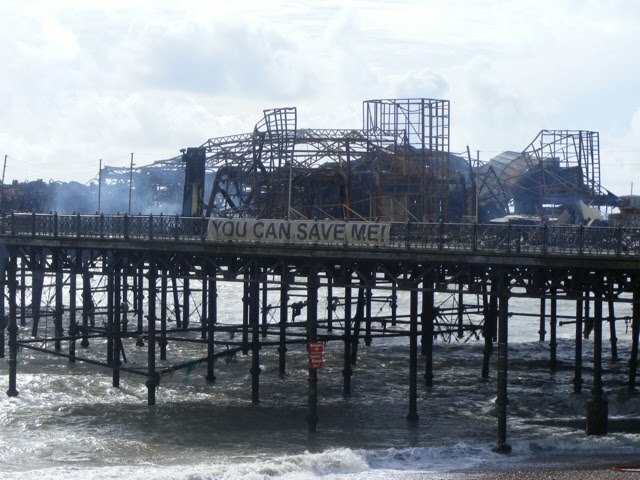 The people of Hastings are right to care about their pier. It is a wonderful Victorian structure of enormous historical interest, evoking the brilliance of Victorian engineering and the verve with which the Victorians embraced the English saeaside. It also represents the memories of countless locals and visitors who have enjoyed variety performances, plays, rock concerts, winnings, strolls, and views of the sea here for more than 130 years. Assessment of the damage is now underway and, with the HP&WRT still working to raise funds, there’s a chance people will continue to enjoy the pier. Go to their website to check out their progress and donate. Thanks to Ann Kramer for the photograph. A way to the south of Great Malvern – famous for its grand medieval church, its spa, and its clusters of Victorian villas – lies Little Malvern. This is the site of a Benedictine priory founded in the 12th century, and what remains of its church – tower, chancel, and ruined transept – catches the eye and the sun as one looks across the fields towards the wooded slopes beyond. It’s a mixture of Norman and late medieval architecture, having had a makeover in the 1480s when monasticism in England had little more than 50 years before succumbing to the ravages of Henry VIII’s opportunistic reformation. Next to the church were the usual domestic buildings, and part of these form the heart of Little Malvern Court, the partly timber-framed house to the left of the church. This too is of a mixture of periods, with a monastic core of the 14th century that includes the magnificent prior’s hall, plus later additions and modifications. The building was restored and extended by Joseph Hansom in 1859–60. It’s no accident that the Catholic architect Hansom was chosen. Since the 16th century the Court has been home to the Beringtons, a Catholic family. 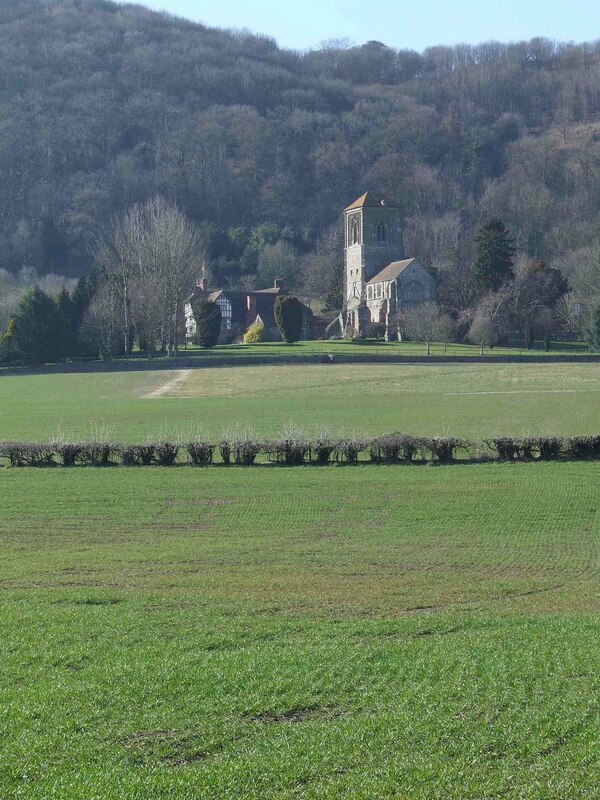 In the Middle Ages, the church tower must have been a welcome landmark to the monks returning from work in the fields or from journeys farther afield as they crossed the neighbouring plain. It’s wonderful that it remains a landmark today, with its neighbouring house testimony to more than 800 years of continuous use. Even in these days of colour reproduction and the electric glow of the internet, it’s all too easy to think of history before the Renaissance as taking place in a palette of greys under a cloudy sky. Most medieval churches no longer have their wall paintings and stained glass; castles have lost their banners and heraldry; we talk about black-and-white houses and silvery stone; we imagine peasants grubbing around in dingy hovels. This view of the Middle Ages is way off target, of course, as I've noticed before. We know more about the colour and comfort of the Tudor period, from the surviving great houses. The grandest Elizabethan rooms were heated with big fireplaces and walls hung with thick tapestries. But how were smaller buildings decorated? What options were open to you if you couldn’t afford rich tapestries? 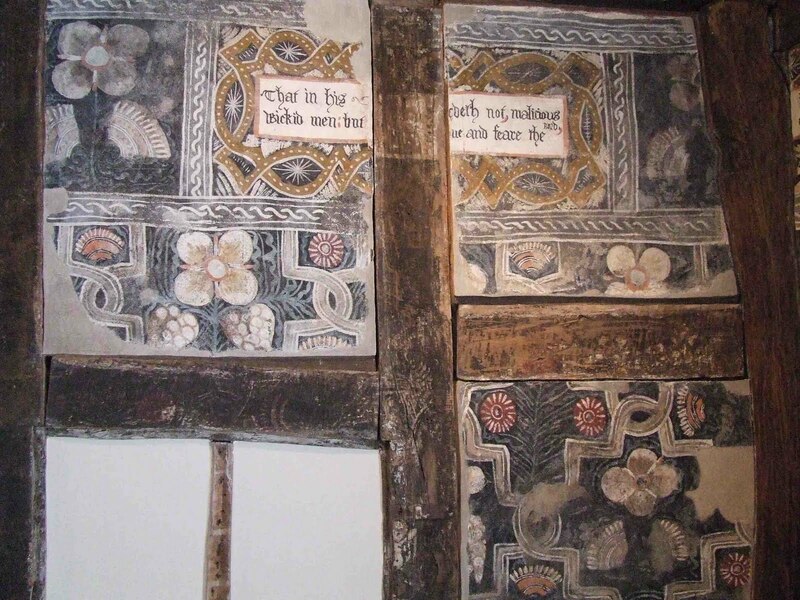 A look inside most small Elizabethan houses today and the chances are you’ll find a very simple colour scheme – pale plasterwork and perhaps, if the building is timber-framed, the same ‘black and white’ effect as on the exterior. But it wasn’t always like this. 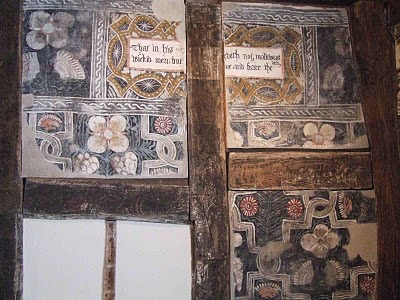 In Ledbury is the rare survival of a 16th-century colour painted interior. Here the walls were decorated in a pattern that imitates the designs of contemporary tapestries – stylized flowers and fruit within intricate borders resembling the formal hedges of an Elizabethan knot garden. Their splashes of red, blue and gold must have glowed 500 years ago. In addition there are panels bearing inscriptions, quotations from the Books of Psalms and Proverbs, instructing us how to live our lives. ‘Better is a dinner with greene hearbes where love is, then a fat oxe and hatred therewith. '* According to some sources, the presence of these sententious moral comments may relate to the fact that this building might once have been used as a local court – probably a court of ‘pie-powder’, dealing with the running of the town’s market and related matters. I'm not so sure: the sentiments seem more domestic to me. Whatever their origins, these rare painted walls give us a precious insight into the way provincial buildings could be decorated in the 16th century. At least some people aspired to the kind of colour more readily accessible to the upper classes. And the setting of history was not always black, white, or grey. *Proverbs 15.17, Geneva Bible. Thanks to the readers who identified the translation. John Britton’s The Architectural Antiquities of Great Britain, a work of the early-19th century, was, according to the RIBA ‘from its inception…received as marking a new era in architectural topography’. The book consists of a series of essays on notable historic buildings, from castles and great houses to abbeys and churches, each accompanied by engravings – plans, the occasional measured drawing, and more atmospheric portraits of the buildings in their landscape settings. John Britton was born in Wiltshire in 1771. As a young man he worked as a wine merchant’s apprentice and cellarman, studying on his own in his spare time and meeting his friend Edward Wedlake Brayley in a bookshop in Camberwell. Soon Britton got a job as a lawyer’s clerk and began to write for publication too. A book on his native Wiltshire led to a long collaboration with Brayley and others on a series on the English counties. During his work on the counties Britton gathered together a team of artists and engravers, and many of these also worked on The Architectural Antiquities. They rose to the challenge posed by Britton’s aim, to show the distinctive styles of medieval architecture, by ‘correct delineations and accurate accounts…drawn and engraved with scrupulous accuracy’. Nothing like this had been attempted before and if Britton’s historical texts were not always accurate, the illustrations were both informative, evocative, and worthy of their subjects. They were influential too, helping to put the Gothic revival on a new, more historically informed, footing. This example, ‘etched by Wm. Wise from a Sketch by B. Howlet’, shows the massive great tower of Conisborough Castle in South Yorkshire. The tower was built in around 1180, when the castle was held by Hamelin Plantagenet, half-brother of Henry II. With its circular plan and enormous buttressing protrusions, the tower displays a strong and unusual design. The nearest thing to it is a castle at Mortemer, near Dieppe, which was also held by Hamelin’s family, and it may be that it was designed by Hamelin himself. 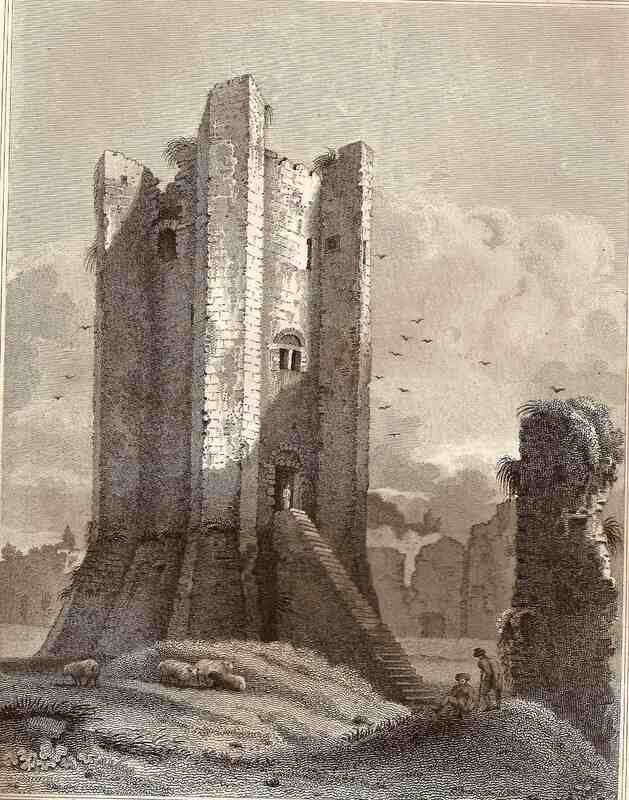 The view of the castle in Britton’s book is very much of its period. It evokes the time when you came upon such ruins to find them rather unkempt. There were plants growing on the stones here and there, walls might be ivy-covered, and the surrounding grass was kept short by sheep or goats. Visitors sat down to rest on unexcavated lumps and bumps probably marking the sites of demolished walls, and birds wheeled around overhead. A Romantic poet would have his notebook out in a trice and the engraving has perhaps drawn out the Romanticism of the scene by slightly exaggerating the height of the tower in proportion to its diameter. The image evokes some of the wonder people in the early-19th century must have experienced in coming across ruins like this. Most of our castles are so conserved and curated now that this kind of encounter can happen only rarely. But now and then, when a ruin has been left in its overgrown state (Wigmore Castle is a favourite example), we can recapture something of this surprise and appreciate anew the original thrill of Britton’s publication. Sir Christopher Wren is probably Britain’s most famous architect. Most people know him as the designer of St Paul’s Cathedral and of the churches that replaced those destroyed during London’s great fire of 1666. Because of this glorious legacy, we think of Wren mainly as a classical architect, a man at home with domes and Corinthian capitals. But Wren was a versatile architect – the rich variety of his London steeples shows that – and he could turn his hand to Gothic too. St Mary Aldermary (the curious repetitious name is probably an indication that this was originally the oldest of London’s churches dedicated to the Virgin) is Wren’s great essay in the Gothic style – Pevsner thinks that it and St Mary’s Warwick are the two best Gothic churches of the period. It’s not quite the kind of Gothic a medieval master mason would recognize: that’s a plaster vault, not stonework. But with its fan vaulting, flattened arches, and tracery, it’s still a beautiful take on the late Gothic that became fashionable in the 15th century. This church is also an example of the architect’s ability to adapt to his sites. Nearly all Wren’s city churches are hemmed in by the surrounding building plots, so they often have irregular or unconventional plans. In the case of St Mary Aldermary, the east wall with its big window is not at 90 degrees to the flank walls. The effect is rather odd, but it’s also another example of the endless adaptability of Sir Christopher Wren. Every time I go to Bath I marvel at its Georgian architecture. The way both individual buildings and the larger plan of the town, the sense of both architectural and urban space, have survived into the 21st century is simply glorious. And the place is very well looked after, so its survival looks secure. There’s so much to see in a place like Bath that the eye doesn’t know where to look next. At one moment the visitor is trying to take in an entire sweeping terrace or crescent, the next focusing on some detail – a door surround, say, a carved street name, a bit of ironwork. All of which can make it easy to miss things, such as how some of these buildings, beautifully preserved though they are, have been altered over the years. Look at these two houses, part of a sequence that steps its way majestically up Gay Street. Most of my readers will notice quickly one difference between them. The windows of the house on the left still have their small panes, four up and three across, while the windows on the right have been converted to plate glass. All expect for the small unregarded windows in the attic and basement – the ‘low status’ servant-haunted parts of the house, which the Victorians did not think worthy of clear, shiny, plate-glass windows. Examine the right-hand house more closely and you’ll see another difference. The windows on the central floor are taller than those in the house on the left. And the left-hand house has a band of stone running beneath the widows at this level. This suggests that the Victorians made another change – they lowered the sills of their middle windows to make them taller, eliminating the stone band in the process, to give more emphasis to, and bring more light into, the principal rooms on this floor. This would have been a labour-intensive job, but it was quite often done in Bath. One cold go on, of course. About the preserved shutters in the right-hand house, which are at odds with the opportunistic and unfortunate window blinds. And the window box on the left. And the paint colours: who’s for National Trust green? Or neutral white? Do any experts in historic paint finishes read this blog, and can they tell us what colour they’d prefer? 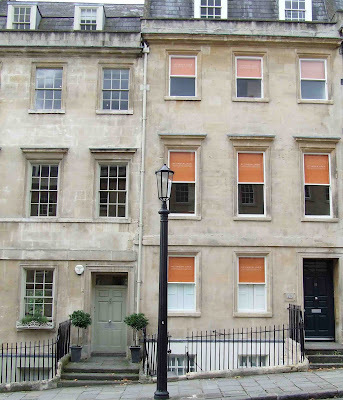 The houses in Bath, then, well preserved though they are, exhibit lots of changes, many of which are themselves historical indications of how taste has changed. Such changes are interesting in their own right. These are real houses where real people have lived and it’s fascinating to find signs of their presence and traces of their taste. I’ve refreshed my ‘Ten of the Best’ feature, with ten new links in the right-hand column to some favourite posts from the English Buildings blog from the past months and years. This time the theme is places of worship, and I’ve gone for a selection of unusual post-medieval churches and chapels from the Tudor period to the Arts and Crafts movement of the late-19th and early-20th centuries. I hope you find something to enjoy here, especially if you’ve come to this blog recently and missed many earlier posts. All Saints’ church, Billelsey is between the towns of Alcester and Stratford upon Avon. It’s a tiny church with an atmosphere that you could best describe as ‘country Georgian’ – round-headed windows, box pews, plain white walls. There’s a tradition that Shakespeare married Anne Hathaway here, and in their day the church would probably still have had its some of its medieval fittings and atmosphere – it would have been darker, with smaller windows and maybe this wonderful carving, now on display inside the church, was over the door. A carved relief like this is a real surprise in rural Warwickshire. Its style (the vigorous interlacing foliage, the linear design on the figure’s kilt-like costume, the bird, the serpent) is like the work of the Herefordshire sculptors of the 12th century – I’ve posted previously about their wonderful carvings at Kilpeck, Shobdon, and Castle Frome. But their work wasn’t confined to Herefordshire – there are a few examples in nearby counties such as Gloucestershire, Worcestershire, and Warwickshire too. The Billesley carving seems to show a man, pursued by sinister forces (a serpent and a dragon) trying to escape towards a dove, symbol of peace, purity, and the Holy Spirit. The whole carving of this figure on his path through life is bursting with vigour and the surprise of finding it among the plain white walls of this quiet church is part of the pleasure it gives. There would no doubt have been more carvings here by the same 12th-century master, but all except this one and a fragment of a stone cross have vanished in later rebuildings of the church. We can only be grateful for the burgeoning vigour of what survives. Note This church is in the care of the Churches Conservation Trust. Doing the previous post about the lookers’ huts of Romney Marsh reminded me of my last trip to the Marsh a couple of years ago, in the company of friends and marshophiles from Hastings (you know who you are and how grateful I am for your hospitality). A favourite building from that trip was St Augustine’s church at Brookland, with its extraordinary detached belfry shaped like an overgrown candle-snuffer. Brookland church also has some curious contents – a set of late-18th century weights and measures, a chest said to come from the Spanish Armada, and the odd item shown in the photograph above. What could it be? If you think it looks rather like a sentry box, you’re quite close. It’s apparently designed to provide shelter for a priest taking a funeral service in the churchyard when wind and rain are whipping across the Marsh. The name for this miniature portable building is a hudd or hud, obviously the same word as ‘hood’, although I can’t find a reference in the OED to the term being used in this way. The funeral hudd is a piece of plain and practical joinery that is just about light enough to trundle out into the churchyard when needed and has just enough space for a person to stand up in. I’m not sure when it was made or when it was last used – it seems redolent of Georgian clergymen wanting to keep their wigs dry, or slightly later ones keeping the mud off their cassocks. Maybe Jane Austen’s Mr Collins would have used a hudd – though he might have worried that it concealed him from the watchful gaze of his patron. Lady Catherine De Bourgh. The flat landscape of Romney Marsh is dotted with a number of small buildings that most of us would hardly give a second glance. Tiny, brick-built, with a pitched roof and a chimney at one end, these are the lookers’ huts that provided shelter for those who looked after sheep on the marsh and who needed to be near their flocks for weeks on end – especially during the lambing season. Although they’re not elaborate pieces of architecture, these huts are important because they were a vital part in the lives of ordinary people for many generations over a period of around 200 years. Once there were hundreds of lookers’ huts, but now only 12 survive intact. Changes in farming and lifestyle have meant that many have disappeared and, because most of them were in isolated positions they often found no new use. As a result they were seen as superfluous and many were knocked down; others succumbed to time or vandals. If the remaining lookers’ huts are not to go the way of the rest, wiping out a unique piece of history, they need advocates, and they have a powerful one in Mark Duncan, who has made it his mission to photograph all the remaining huts. Now there is an exhibition of some of his photographs of the huts, highlighting those that are most at risk. 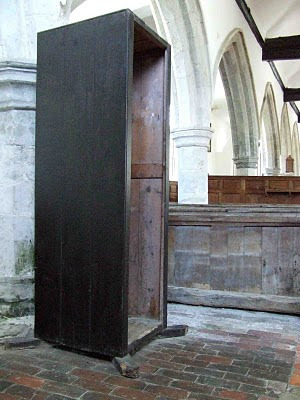 I for one hope that Duncan’s exhibition succeeds in its aim to raise awareness of these very special structures and their role in the lives of generations of lookers who worked beneath the endless open skies of Romney Marsh. Giving Up The Ghost, an exhibition of photographs by Mark Duncan, is at the Romney Marsh Visitor Centre, Dymchurch Road, New Romney, Kent, from 28 August to 25 October. There is more about it, with examples of Mark Duncan’s photographs, here. The photograph above is by Mark Duncan. When it comes to parish churches, small is often both beautiful and interesting. Small churches in isolated locations sometimes survive with ancient features intact better than churches in towns and villages on the beaten track, where wealth, piety, and fashion often led to frequent restorations and renovations. Shorthampton in western Oxfordshire, set on a quiet lane not far from Charlbury, is a mixture of Norman, Gothic, and Georgian. 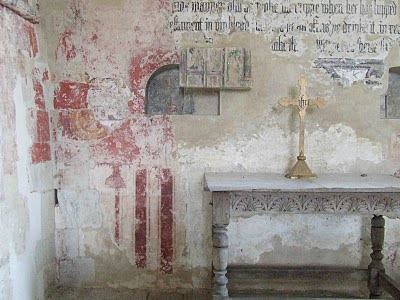 But its main interest, apart from the quiet churchyard view views across undulating hills and farmland, lies in its wall paintings. Because so many images in English churches were destroyed in the 17th century, English wall paintings are mostly fragmentary. What were once entire cycles of images, showing, say, the story of the Passion, are now reduced to a few scraps; a large Last Judgement may be recognisable only by a small group of devils; a feathered wing may be all that’s left of an angelic host. As a result, what survives has a quality of serendipity, and often, divorced form its context, of surprise. 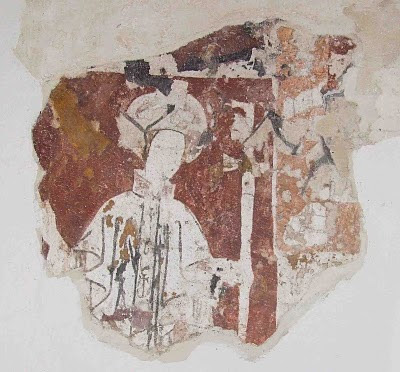 At Shorthampton we are treated to a dragon’s wing (presumably all that is left of a painting of St George), a Last Judgement so faded as to be virtually indecipherable, and images showing a bishop (above) and of various saints, not all identifiable but remarkably including St Zita, patron of domestic servants and a far from common subject. And then there is this unusual subject, the Miracle of the Clay Birds. This is the story of how the infant Jesus modelled some birds out of clay and then brought them to life. If it’s unfamiliar, that’s because the story is told in one of the apocryphal gospels, that of St Thomas. At Shorthampton, although the painting is faded, the Virgin, the infant Jesus, and another child – perhaps John the Baptist – are clearly visible, along with one of the birds. It is indeed surprising that in this tiny, isolated church, up a lane with just a few farms for company, this obscure story should be portrayed. But miracles fascinated the medieval artists, and miraculous episodes from apocryphal narratives by James, Thomas and the ‘pseudo-Matthew’ (all gospels that satisfied an understandable craving for information about the infancy of Jesus) appear in various churches. No doubt many such images have been lost. It’s a small miracle in itself that in this Oxfordshire church such a painting has survived. This building at the corner of Coptic Street and Little Russell Street in Bloomsbury is well known as the second restaurant to open in the Pizza Express chain. 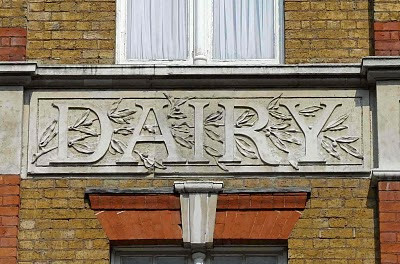 But the beautiful lettering high up on the wall proclaims its earlier history as the premises of the Dairy Supply Company. It dates from 1888 and was designed by R P Whellock, an architect I know nothing about – if you have any information about him, do please leave a comment. In the dairy on Coptic Street, Whellock put in big, round-headed windows on the ground floor – these were apparently typical of the architecture favoured by the Dairy Supply Company. Original diary tiles are preserved inside, too. Outside, the mix of coloured bricks and the other details are typical of the period, but this lettering with its interweaving foliage helps the building stand out above the crowd. 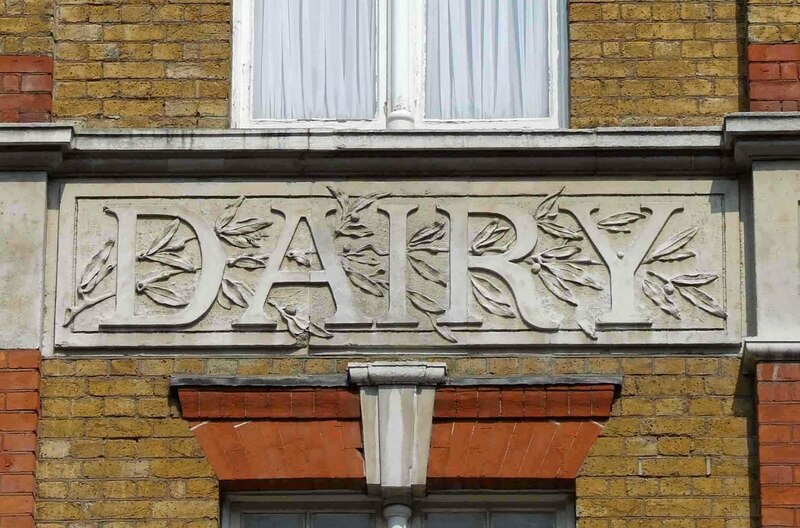 A reminder that there were once dairies all over the capital and another reason to look up in London. In contrast to the grand town hall of the previous post, here is a market hall, plain and simple, in the middle of the beautiful Cotswold town of Chipping Campden. The market hall was put up in 1627 by Sir Baptist Hicks, a London mercer who built a mansion for himself at one end of Camden and made various gifts to his adopted town. The building was intended for use for the sale of poultry, butter, and cheese. It consists of little more than three rows of arches, a stone floor, and a roof, but they are done with such simplicity in golden Cotswold stone, that the building provides the perfect centrepiece to the main street. Chipping Campden, which came to prominence as a centre of the wool trade in the late Middle Ages, is one of the most perfect of all the Cotswold towns. That it is still so perfect is due in part to the numerous craftsmen and artists who lived there in the early-20th century, many of whom came to Gloucestershire under the auspices of C R Ashbee’s Guild of Handicraft. 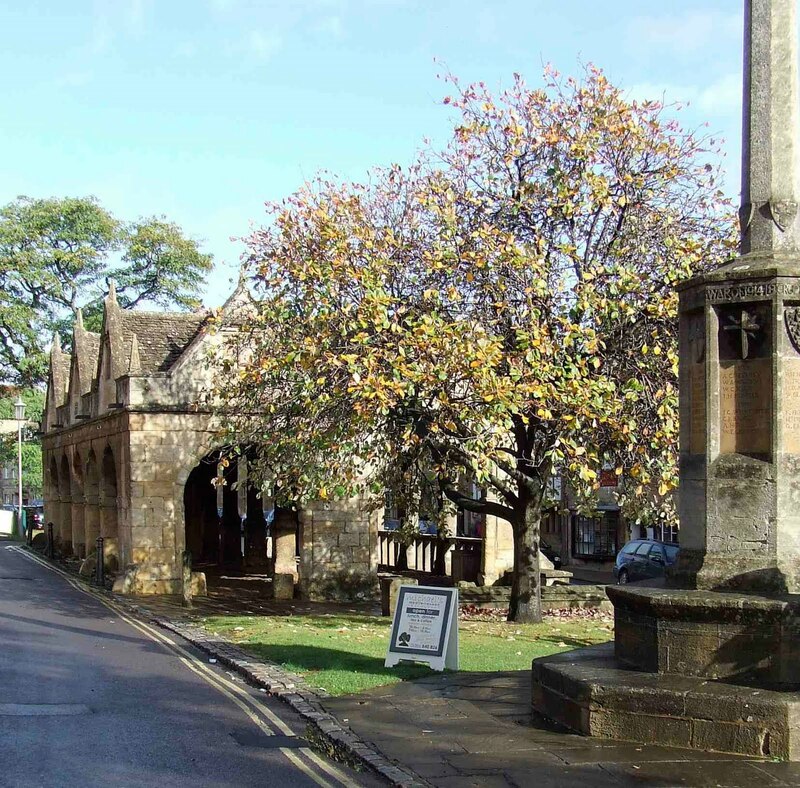 It was Ashbee who repaired the market hall in 1903 and the artist F L Griggs, another Campden resident, who designed the war memorial, partly visible to the right of the picture. This is a place that has inspired artists and artisans, and they have repaid it with the work of hand, heart, and head. 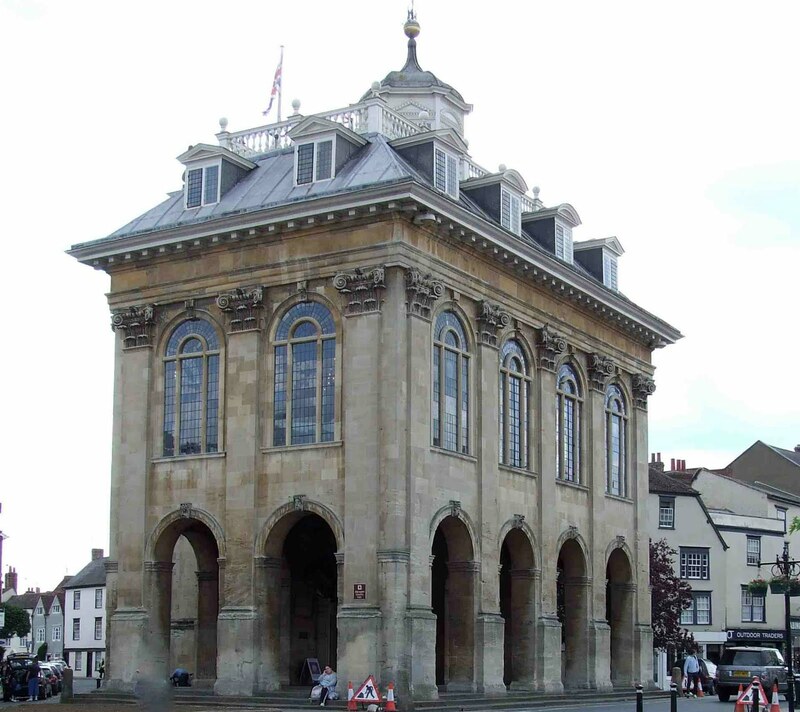 Of all the town halls that take the traditional form, with arches for a market on the ground floor, Abingdon’s is probably the most imposing. Its size is a reminder that Abingdon was once the county town – of Berkshire, not the Oxfordshire that it has found itself in since the sorry bodge that was the local government reorganization of 1974. This stupendous building was constructed in 1678–82 by Christopher Kempster, one of the master masons who worked for Christopher Wren on his projects in the City of London. No architect is recorded. 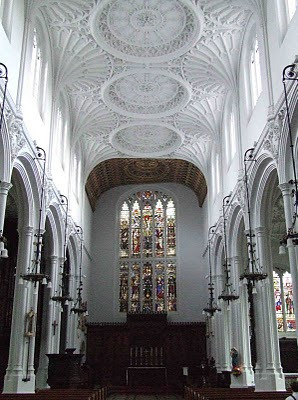 Maybe Kempster did the drawings, maybe Wren himself was involved – Pevsner points out that the large first-floor windows are like the ones Wren designed for the library of Trinity College, Cambridge. Whoever did the design, it’s a triumph, from the vast arches to the dainty cupola set in the middle of the hipped roof. Although it is made of traditional ingredients, combining the old market-hall concept with Classical details and the familiar hipped roof, it still manages to surprise and impress: there is nothing quite like it. I’ve posted at least once before about my liking for traditional English town halls – the kind that form a central landmark in a town, often with a space for a market beneath and a wooden turret or cupola on top. This is one of my favourites, and it provides a stunning centrepiece to the town of Tamworth. I admire its chequered brickwork, its simple Tuscan arches under which the market was once held, and the collection of engaging details on this end wall. I suppose if I were being critical I’d say that the generous round-headed windows and the triangular pediment with its enormous dentils are enough – the design doesn’t exactly need all the bits in the middle – the clock (a later addition), the plaque, the heraldry. But, cluttered as they are, they add to the charm of this building and to the information it imparts. The plaque, for example, tells us that the town hall was built by Thomas Guy, no less, the founder of Guy’s Hospital in London. Guy, whose mother came from Tamworth, made his money as a publisher and bookseller in London. 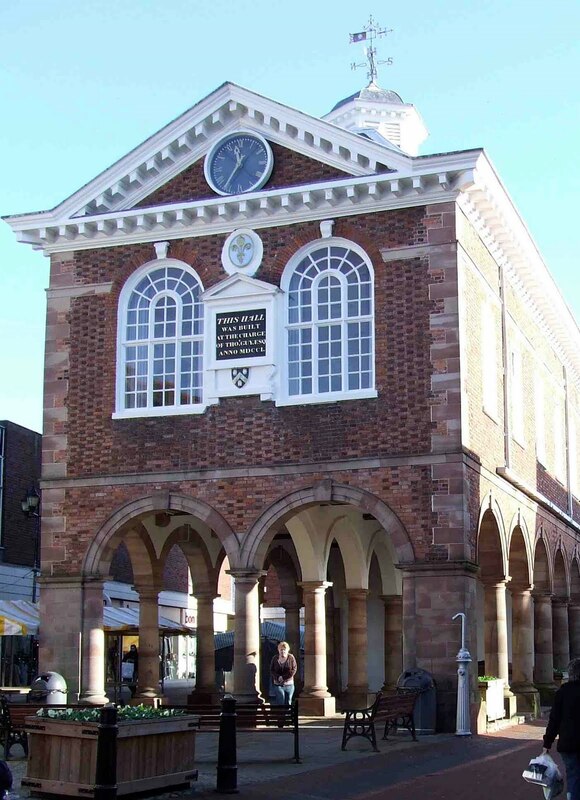 He made some generous gifts – to St Thomas’s Hospital, to Guy’s itself, and to Tamworth, where he built almshouses as well as the town hall. The coat of arms relates to Guy too, and also appears on Guy’s hospital in London. In spite of his benefactions, Guy had a reputation for being mean. Perhaps that’s partly to do with his reaction in 1708, when he was unseated as Tamworth’s MP. In response he excluded Tamworth residents from his almshouses, restricting them to people from the nearby area and to his own relations. But at least by then the people of Tamworth had their town hall. He couldn’t take that away from them. Bazza, at the blog To Discover Ice, has a post about the Guildhall at Thaxted, which is the timber-framed 16th-century grandparent, as it were, of the Tamworth town hall and other buildings of its ilk. I recently did a couple of posts called ‘Layers of history’ about places constructed on prehistoric sites. As more than one reader said, this whole blog is really about layers of history – and they could have gone further and said that virtually every building that’s not spick and span new is an example of historical layering, so great is our passion for altering and adapting buildings, furnishing them and leaving our stamp on them. 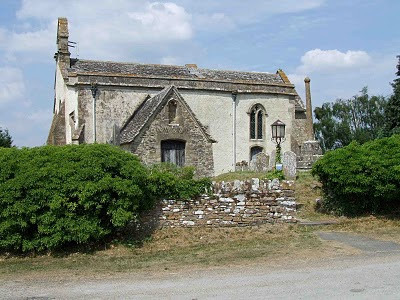 The tiny church at Inglesham in Wiltshire is one of the most layered of them all. A largely 13th-century structure, based probably on a late-Saxon original, it contains a Saxon carving of the Madonna and Child, windows from the 14th and 15th centuries, timber screens of the 15th and 16th centuries, 17th-century pews and pulpit, and a range of wall paintings representing every century from the 13th to the 19th. But that prosaic list tells not half the story. This isolated church – it has just a couple of houses for company down a lane that leads nowhere else – has an atmosphere of quiet and calm like few others, testimony to the care that has been lavished on its fragile fabric and furnishings, especially over the last century or so. That it has survived is largely due to William Morris, who lived at Kelmscott not far away, loved this place, and knew the Victorian rector, Oswald Birchall. Birchall wrote to Morris saying that he had no money to carry out the necessary repairs to the church, and neither had the parishioners. Morris put Birchall in touch with the Society for the Protection of Ancient Buildings, who both supervised the restoration in the 1880s and 1890s and, in an unusual move, also raised money for it. Morris too contributed money, anonymously, to keep the work going. And so the repairs were carried out with the greatest care and respect for the building, under SPAB principles – nothing old was destroyed if it could be repaired, new work was not disguised, new additions were made to fit the old fabric (not the other way round), and so on. As a result of Morris’s commitment, this wonderful church survives, with both its historical layers and its ancient peace. On my last visit to Inglesham I was enjoying the building in solitude when the door opened and a party of half a dozen visitors came in. Frankly, my heart sank. No more contemplative silence, I thought. How wrong could I be? Each of the visitors approached the chancel, bowed towards the altar, and made the sign of the cross, before inspecting the building in awed reverence. After a while, one of them came up to me. ‘They are from Warsaw,’ he explained, in good but accented English. ‘They have been to the Tower of London and Windsor, so I had to bring them here. To show them this unbroken link with the Middle Ages, even with the Saxons.’ An unbroken link with the layers of history. And one of the best. How true. 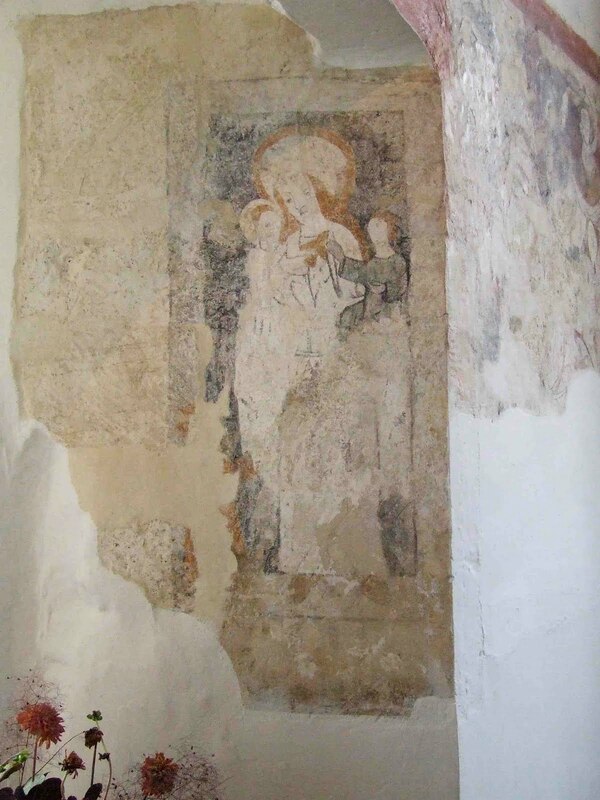 Note A commenter has pointed out that conservation work is now (20 August 2010) underway on some of the wall paintings at Inglesham. This means that there is a lot of scaffolding in the church and the opening times are restricted. 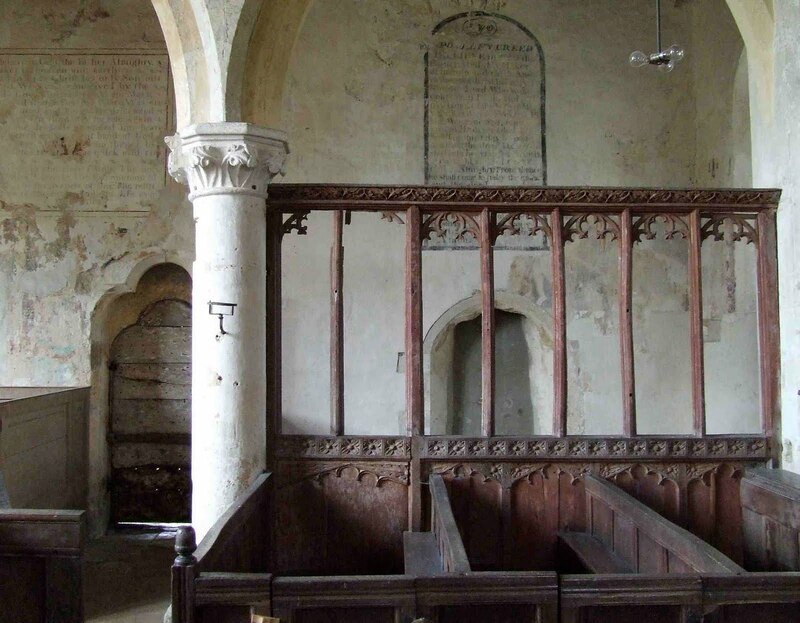 This church is in the care of the Churches Conservation Trust, which looks after churches of historical and architectural interest that are no longer needed for worship. They deserve our support. One sunny afternoon in 1904 the artist F L Griggs came to the small town of Winchcombe in Gloucestershire, paused in the main street, and began to draw. Griggs, who had settled in Chipping Camden the previous year, was getting to know the Cotswolds well because he was doing the illustrations for the book Highways and Byways in Oxford and the Cotswolds, one of a series on British counties and regions. The book was to be published by Macmillan in time for Christmas 1905. With his newly acquired local knowledge, Griggs no doubt came prepared for the strong shadow cast across this street, which runs basically east-west, although with such a concatenation of curves that its limestone houses, bonded together in a continuous terrace running towards the 15th-century church, are all higgledy-piggledy. 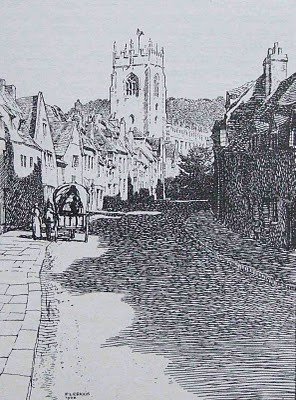 At this stage in his career as an illustrator, Griggs used ink, and he employed thousands of fine lines to depict the play of shadow on cobbles and limestone, and a much more sparing, almost hesitant line for the houses and church tower bathed in sunshine, so that they seem to shimmer in the light. Using this painstaking way of working, Griggs could sometimes delineate buildings with startling precision – in some of his other drawings, virtually every stone is outlined, every warp in the timbers of a weatherboarded barn. This illustration is slightly looser but still meticulous and wonderfully conveys a sense of place – and as it virtually depicts the view from my front door, I can say this with confidence. This remarkable collection of houses – of various dates between the 16th and 20th centuries, and many containing within them fragments of still older buildings – not to mention the play of sun and shadow, have been caught well. But Griggs’s way of working also caused him problems. He drew very slowly, and his publishers got frustrated, eventually bringing out the book with fewer illustrations than planned, and reducing the artist’s fee by ten per cent. So for future books in the Highways and Byways series, Griggs used pencil, in which he could work faster in a slightly looser, though still detailed, style. He was a good draftsman with the pencil, but something was lost, and I’m pleased that when he came to this street in Winchcombe – a street that has changed little since 1904 apart from the replacement of cobbles with asphalt and the arrival of a large number of cars – he was still using his painstaking pen.